Looks like Trump will again give his Christian-right supporters everything they want. As many observers feared, when Donald Trump announced at the beginning of this week he would keep in place an Obama executive order prohibiting discrimination against LGBTQ folk by federal contractors, plans were already under way to issue a new “religious liberty” order that would negate the earlier gesture. It reflects the demands of conservative Christians for (in effect) plenary permission to violate anti-discrimination laws and policies that allegedly trouble their consciences, without any consequences for their dealings with the federal government, whether it is as employees, contractors, federally subsidized entities, or as beneficiaries of the tax exemption for nonprofit organizations. And sweeping aside the history of such exemptions as confined to religious organizations and their offshoots, the draft order would be extended to individuals whatever their business. In effect the order would (so far as the federal government’s regulatory power reaches) let conservative Christians create their own parallel society where it is still 1972, and abortion is illegal, birth control is discouraged, and anyone who is not heterosexual can be openly discriminated against. Its description of the protected beliefs so tracks conservative evangelical and traditionalist Catholic tenets that it screams for a First Amendment challenge, though if promulgated we can be sure it would be defended as applying equally to all religions (just like, wink wink, the travel ban). When your inspiration is the social policies of the State of Mississippi, you are already on constitutionally shaky grounds from the get-go. As Posner notes, the provisions of the order dealing with Obamacare’s contraception-coverage mandate sweep away years of painstaking compromises over how to provide coverage without requiring direct subsidies from religious organizations, and jump the gun on the Obamacare repeal and replacement that Republicans are struggling with in Congress. In reading that section, keep in mind that most of the people fighting contraception coverage claim that a variety of common birth control methods are actually “abortifacients” because they may in some cases violate the sanctity of a fertilized ovum. 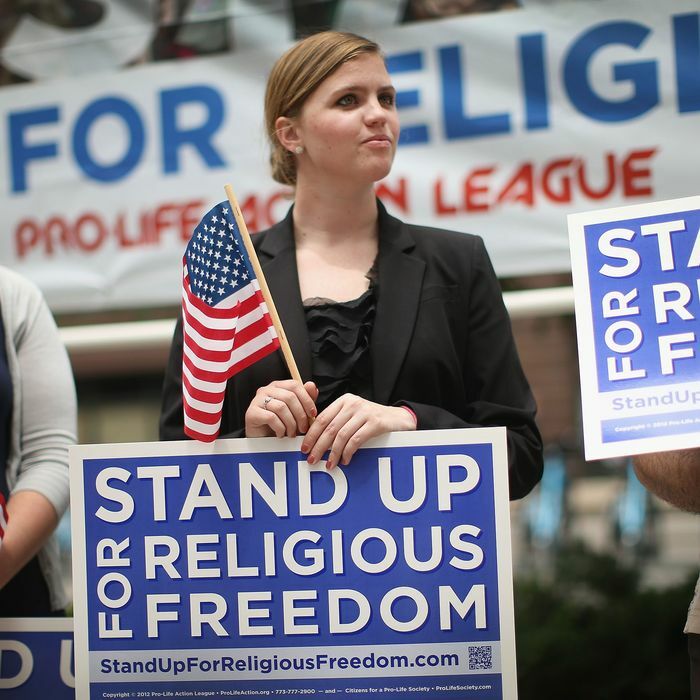 The same section, by the way, directs the Justice Department to “establish a new section or working group dedicated to protecting ‘religious freedom.’” So the order would not represent some one-time gesture but the beginning of an institutional commitment to fight for the religious right to discriminate. No one knows how close the administration is to issuing the draft order. One would normally think the torrent of criticism it will soon receive, not just from equality advocates but from legal experts horrified by sloppy drafting, will make a big difference. But this is the White House that issued the travel-ban order in a huge hurry, with indifference if not enthusiasm for the chaos it would cause. It is interesting that the new “principal deputy press secretary” sent out by the White House to stonewall media questions about the draft order was none other than Sarah Huckabee Sanders, a Christian-right political fixture who ran her father’s 2016 presidential campaign before joining Trump’s when Huck dropped out after the Iowa caucuses. This is not an administration that will be even-handed on the conflict between LGBTQ and reproductive rights and the “right” to override them in the name of an angry God. Trump can provide happy talk all day long about his own supposed tolerance and social progressivism. But as he showed in finding a Scalia clone for SCOTUS and now in moving toward the widest possible validation of religious-based discrimination, he knows who butters his political bread, and he can be expected to continue to pay his debts to the cultural and religious right.